Do you remember the air filter that was installed with your air conditioner? If not, we urge you to go check on it right away! The air filter isn’t just an optional accessory—it’s a fundamental part of your HVAC system. If you don’t believe us, go take a look at it now and see how much dirt and dust has accumulated on it. If it weren’t for that air filter, you can expect all of that to end up inside your system, and that can cause a range of issues. Your air conditioner requires a steady stream of air in order to create cool air for your home. Makes sense, right? How else would your air conditioner function without air? If we’re talking about a ducted air conditioner, then you know that your HVAC system supplies air to the home via air vents in each room. All of the air comes from a central unit, and it must travel through all of the ducts until it reaches the other rooms. So, if you find that a number of rooms in the house are not receiving the same level of cooled air, you might have an airflow problem that’s cutting the supply short. A dirty air filter could be one reason for this. 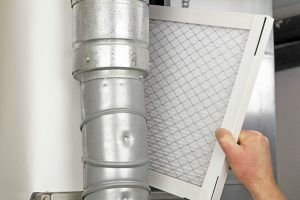 An air filter clogged with dust will also be ineffective at filtering. You can expect some dust and dirt to make its way through the filter and into the system. If enough gets in, it can dirty up the evaporator coil to the point that it freezes over. When that happens, it can restrict airflow, reduce your efficiency, and eventually cause damage to the compressor. Have you ever noticed that your air conditioner runs through numerous cycles during the day? It blows cold air for some length of time, turns off for a while, and then does it again. It’s a normal part of an efficient cooling process. What’s not part of that process is an air conditioner that rapidly turns on and off. This is called short cycling, and it can be very stressful on your system. When your system is short cycling, the best-case scenario is that it can be fixed by changing the air filter. If that doesn’t fix it, you’ll need to consult an expert of HVAC services in Madison, MS.
Got a problem with your air conditioner? Change that air filter! If that doesn’t help, contact AirSouth Cooling and Heating today.